This recipe has several ingredients but is worth the effort. 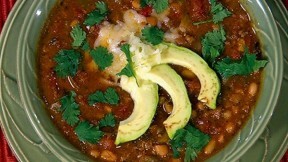 Chili is good most anytime, but especially with cornbread and a green salad, or as a side dish to a barbecue. It also freezes and reheats well. Heat oil in 8 quart medium stockpot on medium heat. Add onion and garlic; cook until softened, about 5 to 8 minutes, stirring occasionally. Add ground turkey and brown; do not drain. Add chopped jalapenos, tomatoes and diced green chilies; stir to combine. Add chili powder, cumin, celery seed, cayenne pepper, cilantro, and parsley. Stir and simmer 5 to 10 minutes. Add white beans and chicken broth, stirring to combine. Add Worcestershire sauce, liquid smoke, celery salt, white pepper and nutmeg. Bring slowly to a boil, stirring occasionally. Cook for about 45 minutes; remove from heat. Top each serving with a slice or two of avocado and grated mozzarella cheese.